Being a software developer, I spent most of my work day with a monitor (well, two actually) in front of me. Very often I have several applications running simultaneously. And by “several” I mean “plenty of them”. There are, among them, a development environment, a command window, an FTP client, a couple of PDF documents, Process Explorer, at least four file explorers, a text editor, and a variable number of browser windows with around 40 tabs open. Switching from a window to another when you have 4 or 5 running application can be tedious. Doing it when you have 15 or 20 of them can be a serious waste of time. In my job (and in everybody else’s, I suppose) keeping focus is fundamental to work out a problem. You can achieve way much more results in a half hour of perfectly focused work, than an entire day diluted in a sea of micro-distractions. An incoming phone call or just a word from a coworker make you lose concentration, and the task you were just about to complete, has to be reworked from scratch. Even who (like me) works with no phone and with silent colleagues, has his share of distractions. Clicking again and again the taskbar searching for the “right” explorer window, or wearing out ALT+TAB to come back to “that” file are horrible distractions. And distractions correspond to wasted time. Not so much for the two seconds spent doing a given action, rather because of missing and finding the focus again. It is essential therefore, in my opinion, to keep everything you use handy. Over the years, I’ve developed some “best practices” in order to achieve this result. And this inspired me to create a tiling window manager like Mosaico (click here to download) . The idea is simple: just organize the most used application windows so that they cover the entire screen. (looks like a cocktail recipe). Using Mosaico you can switch from Snapshot 1 to Snapshot 2 just by selecting it (forward/backward buttons or mouse wheel) and clicking the “screen” button (or double-click the snapshot itself). This is, in fact, like having two monitors. If you consider that Mosaico can save up to 8 snapshots, you can see that customization possibilities are numerous. My personal setup, for example, always has three fixed snapshots spanning two monitors. 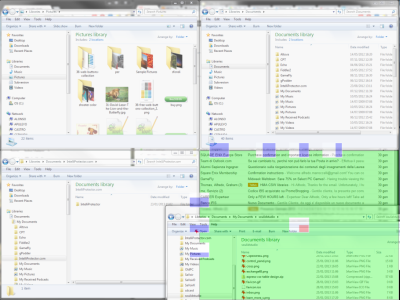 (Main: Visual Studio, Secondary: 1/3 Chrome, 2/3 Chrome). It allows me to work full screen on the main monitor, while I keep an eye on real time analytics for www.soulidstudio.com and my emails + instant messaging. The second snapshot is fully dedicated to File Explorer. It allows me to keep eight paths handy, no need to search through endless folders and copy/paste is much faster. The third one is for surfing/relax. Secondary monitor is set up like in the first snapshot, while main monitor is half browser and half pdf reader (or just two browsers sometimes). Some applications like Process Explorer or the text editor are always minimized and used occasionally. Since I have refined this work method with a tiling window manager I can keep focus for longer periods, I produce more and I work relaxed. I estimate in one hour the amount of time saved. It’s not a statistic measure (hard to do), it’s more the awareness that now I can easily do in a day what a couple years ago used to require much more time.